We bring artistry back to outdoor lighting. We will give you a landscape lighting demo prior to starting and offer a lifetime warranty. Competitively priced. Servicing Elmhurst IL area. 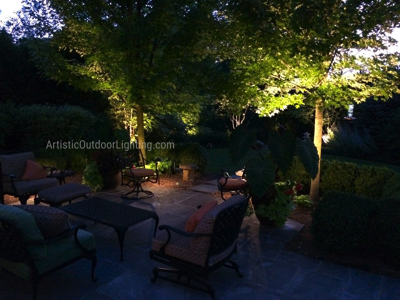 We are your premier source for Elmhurst landscape lighting and outdoor lighting. As 5-time Angie's List award winners serving you for 18 years, we offer 10 year guarantees on all installations and a free in-yard demonstration. We are experts in LED outdoor and landscape lighting and offer the highest level of attention to detail. A home properly lit by Artistic Outdoor Lighting will take on a mystical glow that is sure to "wow" people passing by, as well as give you a cozy, homely feeling every time you return. All of the details you love about your home, no matter how minor major, and landscape elements that you cherish are going to become enhanced and come to life. Your landscape will never bore you. Go ahead and Check out photos of landscape lighting to see what we mean!